The case study she gives is of journalist Deng Fei’s Free Lunch project, which takes micro-donations to sponsor free lunches at poor, rural schools in China. The end of point of this process is a transparent budget report from each school about how the money has been used. The process takes nine steps because rural teachers in poor regions of China do not have access to a reliable smartphones and data connections – so it crosses through various intermediaries, many of which verify the data. So in this case, despite the long game of telephone, redundancy is a feature, not a bug. 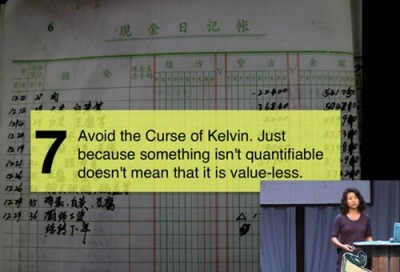 Towards the end of her talk, she uses this positive redundancy example to make a case against the prevailing cult of quantitative data and measurement. Previous post An infamous Chinese hacker becomes a “security professional”?